Possibly the most important part of the eyewear buying process is choosing the right eyeglass lenses. The quality of your lenses, their attributes and their coatings all contribute to how happy you are with your eyeglasses. There are so many options available on the market today, so it can be difficult to decide which type of eyeglass lens is best for you and your unique lifestyle. This guide to eyeglass lenses will help you better understand what options are available to you and help you choose lenses and coatings to fit your preference and lifestyle. The lenses you choose are primarily determined by the vision-correcting properties you are seeking. 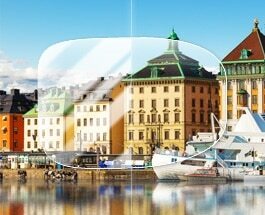 Depending on your visual needs, you may need either single-vision or multi-vision lenses. For many people, single-vision lenses correct their vision sufficiently, either for distance or for reading. If you are part of the 42 percent of the American population living with nearsightedness, you may be looking for single-vision distance lenses to correct your vision. If you have distance-corrective glasses, your prescription will begin with a (-), and your lens will be concave, or curve inward, to correct your vision properly. Reading lenses are designed to help you see things at a close distance, typically between 30 and 40 cm. These lenses are convex, or curve outward, and are appropriate for people with prescriptions beginning with a (+). While single-vision lenses are suitable for a large portion of eyeglass wearers, your eyes may be unique. If you have difficulty seeing at both close and long ranges, you may need bifocals or multifocal. These glasses correct your vision at multiple distances, allowing you to see clearly — both up close and from a distance. 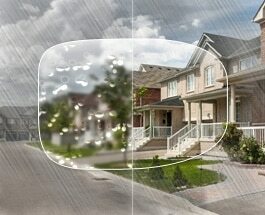 Progressive Lenses are unique lenses, designed to seamlessly incorporate distance, middle- and near- vision correction. Because these lenses are highly personalized, they can correct even the most unique eyes, and provide all the benefits of bifocal lenses without the obvious horizontal line. If you have particularly unique eyes, or need bifocals but do not want the obvious line in your lens, consider progressive lenses. Bifocal lenses are the most common type of multifocal lens. These lenses correct both near- and long-distance vision by combining two prescriptions into a single lens. 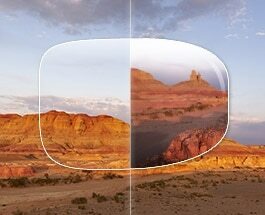 The upper part of the lens is designed to correct distance deficiencies, while the bottom portion is a near-distance lens meant to correct up-close vision. These are excellent choices for people who use both distance and reading glasses, so they do not need to carry around two pairs of glasses wherever they go. 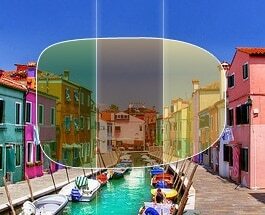 Coating can give your lenses different attributes, making them behave differently according to their environment. Some change colors based upon the lighting, while others offer protection from scratches or the sun. To better understand the options available to you; we’ve listed some of the coatings available in our catalog and what they can do for you. No pair of glasses is indestructible, but that doesn’t mean they can’t be protected. Anti-scratch coating defends your lenses against scratches and abrasions from everyday wear and tear, and helps reinforce them against drops. Everyone can benefit from a little extra protection, which is why all of EyeBuyDirect’s customers can benefit from this incredible coating — it comes free with all of our glasses! Anti-reflective coating is especially important for people with high-index lenses, as these lenses have higher refractive indexes. This increased refractive index means these lenses will tend to reflect up to 50 percent more light than traditional lenses, causing more glare unless they are equipped with AR coating. 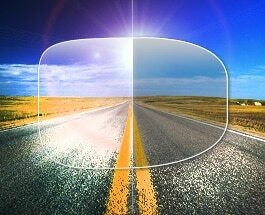 Anti-reflective lenses are important for nearly everyone in the modern world — especially those working around computers or cameras or regularly driving at night. 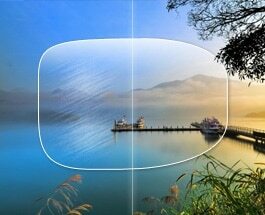 This coating will change the tint of your lenses depending on the amount of light they are exposed to, becoming dark outdoors and clearer indoors. This helps protect the wearer’s eyes from harmful UV rays and direct sunlight, protecting the wearer’s vision. 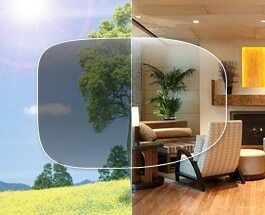 This option does not apply to sun wear options, but is available for nearly all lens materials and designs. We offer premium Transitions™ lenses, as well as basic photochromic lenses, both of which are excellent options for those seeking light-adjusting coating for their lenses. Anyone working in positions where they switch from indoor to outdoor environments frequently will benefit from light-adjusting coating, as well as people who are concerned about their overall eye protection from the sun. Light- adjusting glasses offer the same amount of protection as sunglasses, without requiring you to purchase and carry around an extra set of eyewear. These lenses are ideal for people looking to add some more color to their world, as well as their overall look. 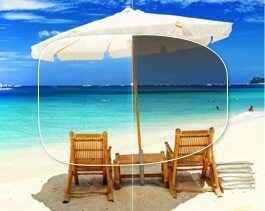 Gradient-tint lens coatings are excellent choices for sun wear. These lenses have a dark tint at the top of the lens and then progressively lighten toward the bottom. The resulting lens offers the wearer plenty of sun protection, as well as privacy, but offer you varying degrees of light. Gradient tints are only applicable to lenses for frames above 36mm in height. If you are looking for sun protection, but are uncomfortable with uniformly dark sunglasses, consider gradient tint coatings instead. This coating reduces the annoying, and sometimes dangerous, reflections on your lenses created by water, roads and other surfaces. These reflections can be distracting or obtrusive, posing a danger to you and your well-being if you are traveling. EyeBuyDirect’s polarized coatings come in standard dark green, dark brown or dark gray tints, so you have options for the look of your lenses. If you drive or bike frequently, and travel along bodies of water or slick roads, you could greatly benefit from polarized coating. If you want to add a little bit of mystique to your look, or simply wish to hide your eyes from onlookers, you may want to look into a mirrored coating on your lenses. Mirrored lenses are functional and fashionable sunglasses with a little extra flash. This reflective coating comes in gold, silver, and blue. Take a look at mirrored tints if you’re in search of a more mysterious style. Athletes should also consider these coatings, since mirrored tints are highly sought-after for athletic sunglasses. Water-repellant coatings keep water droplets, dirt, and smudges off your lenses, which helps to maintain their cleanliness and reduces the need for you to clean them regularly. Lenses with this premium coating stay crystal- clear up to twice as long as your normal eyeglasses! If you live in a rainy area, work, or live around water sources or simply like to be in and around the water, we recommend looking into this lens coating to help keep your lenses as clear as possible! Exposure to the sun’s harmful UV radiation is associated with numerous age-related eye problems, such as cataracts and macular degeneration. Because of this, doctors encourage people to protect their eyes from UV radiation. This is why UV protective coating is so important for everyone. By deflecting harmful UV rays from the sun before they can damage your eyes, this invisible UV protective coating works like sunscreen for your eyes. 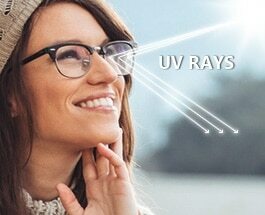 If you are looking to purchase our polycarbonate lenses, you should know that UV protection is built right into them! We spend a huge portion of our days looking at screens — people check their smartphones every 6.5 minutes on average, and 55.5 percent of employed Americans work with a computer every day.We rely on our digital devices,and our connectivity is not going anywhere anytime soon. In the past four years alone, the number of smartphone owners has increased by 82 percent,and this number is still on the rise. However, this increased connectivity comes with risks — especially to our eyesight. The biggest source of potential harm from digital screens is blue light. This part of the visual spectrum is a short- wavelength light, which can be found in just about everything from sunshine to computer screens. Unlike blue- turquoise light, which is healthy and beneficial for us, blue-violet light, such as the high-energy visible (HEV) light from backlit screens and artificial lighting, can be damaging to our eyes after excessive exposure. Up to 75 percent of computer users experience discomfort after using their screens for a long period of time, and considering what looking at screens does to our eyes, it’s not surprising. Extended use of digital devices makes our eyes work harder, requiring them to constantly maintain focus. This can contribute to eye dryness and fatigue, an inability to maintain focus, headaches, and long-term wear on your vision. 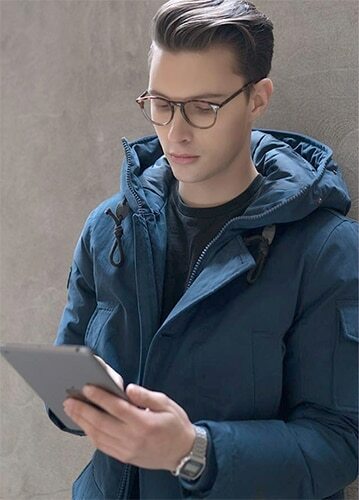 To help protect your eyes from damage, we offer digital screen protection coating, including EBDBlue and SightRelax. Both of these lenses are designed to protect your eyes against the blue-violet light emitted by digital screens, and are also designed to be scratch-resistant, UV-protective, and anti-reflective. The index of your lens, also referred to as the index of refraction or refractive index, is a number that indicates how efficiently the material bends, or refracts, light. The higher the refractive index of the lens, the more slowly light moves through it, and the more the light bends. For you, this means a thinner high-index lens will perform the same as a thick set of standard low-index lenses. Additionally, higher indexes are able to handle higher prescriptions. If you have a particularly strong prescription, a lens with a higher index may be the best choice for you. Here are EyeBuyDirect, we offer lenses with indexes up to 1.74. If you are looking for an economical option for your lenses and have a weaker prescription, these lenses may be the right choice for you. These single-vision lenses are the most basic option we offer, and come free with all EyeBuyDirect frames. This index is most suitable for prescriptions with an SPH correction of +/-2.25 and below, or a CYL correction of +/-1.50 and below. For people with somewhat stronger prescriptions, these lenses may be a better choice than the standard lenses. 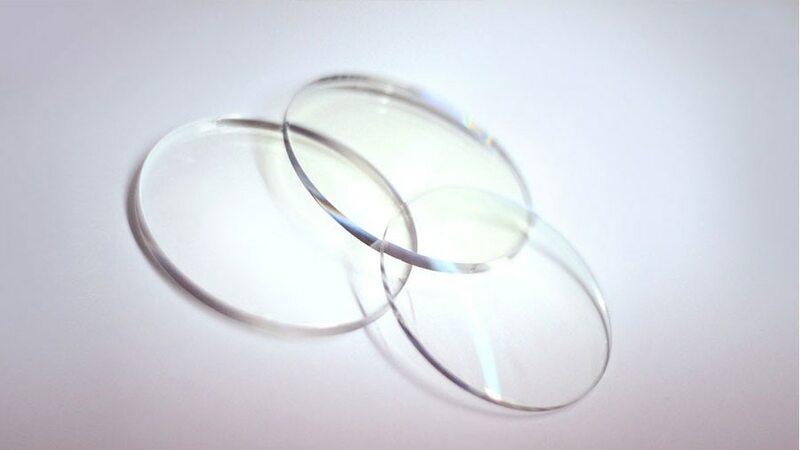 These lenses are thinner and stronger than their 1.5-index counterparts, handling SPH corrections between +/-5.00 and +/-4.00, and CYL corrections of +/-3.00 and below. Polycarbonate lenses are the most durable and impact-resistant lenses in our catalog, and come with a 100% UV- protective coating. If you are looking for glasses for children, or tend to spend your time outdoors, we strongly recommend these lenses. These stylish, super-thin lenses are excellent choices for people with strong prescriptions or particularly thin frames. These lenses are suited to people with SPH corrections between +/-4.25 and +/-6.75, and CYL corrections between +/-2.25 and +/-3.00. These lightweight, thin lenses ensure your eyes do not look distorted from a higher prescription. If you have a particularly strong prescription, this is likely the best choice for you. We typically recommend these lenses for people with SPH corrections between +/-7.00 and +/-9.00, and CYL corrections between +/-3.25 and +/-4.00. Our thinnest lenses are designed for the highest-powered prescriptions. Any thinner and they would disappear! These lenses are best for prescriptions with SPH corrections of +/-9.25 and above, and CYL corrections between +/-4.25 and +/-6.00. Which Type of Eyeglass Lens Is Best for Me? Your vision is critically important to your everyday life, which is why you need a pair of eyeglasses with lenses that optimize your vision. With the help of these guidelines, you can make an educated decision on the type of lenses that will best suit you and your lifestyle. Still not sure what lens you need? Do you want to see what options are available to you? Visit EyeBuyDirect’s vast catalog of glasses and look at our variety of lens options today!